Zentangle fantasy garden using patterns: Myst, Striping, Verdigogh (official Zentangle patterns). The Striping pattern did not work well with this piece, but I decided to go ahead and post it. Color was added with digital scrapbook paper. I have done lots of Fantasy Gardens over the last few years. You can see the bulk of them at my Zentangle Flickr site. Flux is my very favorite pattern of all. I used it exclusively on a mandala section for the ARTbar in Santa Ana, California. 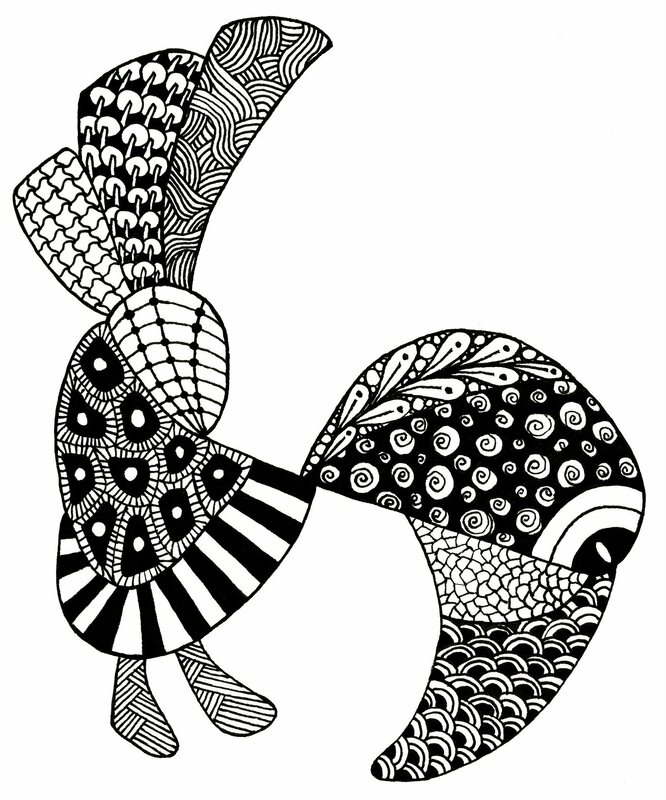 This is an original pattern created by the founders of Zentangle, Maria Thomas and Rick Roberts. You will see many variations of the pattern which is what tangling is all about. I have been working on a large (11" x 14") tangle with tiny, tiny patterns. It is taking me forever. To give myself a break, I drew this one last night just to keep me sane. The color was added with digital scrapbook paper.